I have a recent upcoming late winter trip here in Ontario. The trip organizer has made it a requirement that I have one insulated water bottle for this trip. I carry 1-2L of water in smartwater bottles. I am looking for a lightweight solution to insulate my current set-up or perhaps insight from others on other lightweight options. The water bottle has to be easily accessible and cannot be buried in the center of my pack. Can your jacket be the insulation? If not, the only insulated bottles I'm familiar with are thermos's, which are quite heavy typically. GooseFeet would make a great insulator if you keep it from getting crushed, just thinking outside the box …or feet. 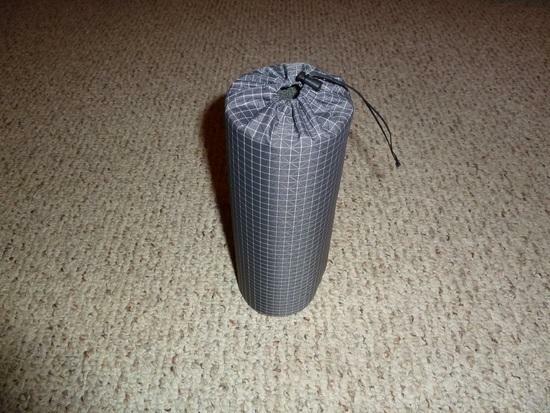 It would probably be your best bet unless you want to go MYOG. I have something similar, but with a shoulder strap instead of clip. It's not really insulated, but the label says it is… I haven't weighed the outer sleeve since I don't use it, but I can't imagine the bottle+sleeve weighs more than 5-6 oz. I think it was about $7. MEC has them but it's a really long URL, just google it. Take 2-3 of the cheap thin open-cell foam beer koozies (the kind they give away at events) and glue them on to the smartwater. The cheap ones are more stretchy and a lot lighter than the more expensive CCF ones. Again, not sure if this will be insulated enough for the organizer. But it will be light and cheap. If it is really cold I still take one traditional OR bottle parka and a nalgene so that I can make a hot water bottle if needed. If I am just worried about freezing water I will often take a gatorade bottle to save weight with the traditional OR parka. I have made my own parka from closed cell foam or reflectix type material and duct tape saves some weight doesn't insulate as well. For me the key is to bring only one insulated bottle and carry any additional water in a nalgene canteen insulated with clothes in my pack. 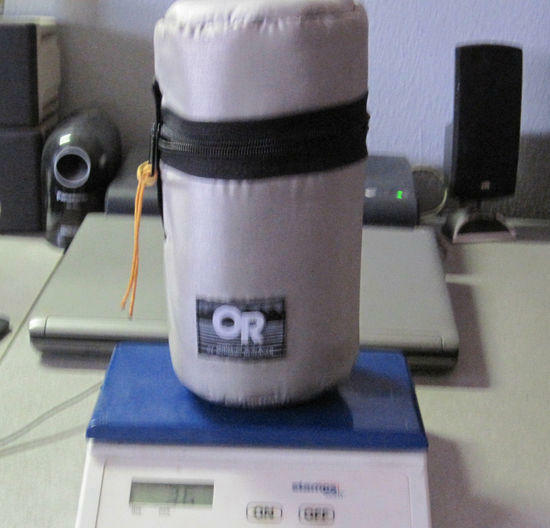 Saves alot of weight from the old multiple nalgenes and parkas paradigm. Since it sounds like the trip leader wants a somewhat traditional approach you might look at the smallest sized OR parka paired with a small gatorade or whatever recycled container fits paired with a soft sided widemouthed container in your pack. Bubble wrap is the lightest, though not quite as efficient as a closed cell foam, like an old sleeping pad. Just wrap the bubble-wrap around the bottle and hold it in place with tape. A very easy make it yourself job. I made one with an old blue CCF pad and duct tape. It hasn't seen that much testing in the cold yet though. I believe he makes insulators for various bottles. i have a pair of his overboots and they are first quality, so i am sure his bottle insulators would be as well. This was brought up a month ago, here. Old wool sock. I took a sock that I retired from normal wear and repurposed it as a bottle cozy. Store bottle upside-down in pocket. Old sock is multi-use (cozy, emergency extra sock, mitten, pot grabber, etc. ), as long as they're dry. Worked great into the teens on many trips. Have yet to test insulating abilities in the summer. Also, the sloshing and movement of hiking should keep the water moving enough to really prevent some solid freezing. You probably know the other basics, like putting the bottles inside your sleeping bag – and boots too – during the night to prevent freezening. How cold are they expecting it to be? It's almost April. What about just wrapping it in your down camp/belay jacket if you carry one? Failing that a OR water bottle parka on my hipbelt is nice. If you think your trip leader might get sniffy about the sock idea, the other thing to use is the silver foil covered bubble wrap available at home improvement stores. Looks more high-tech than just bubble wrap, and is still pretty cheap. Might have a higher thermal value with the reflective foil than plain bubble wrap, but I don't know for sure. Can also make pot cozies and zip-loc food cozies out of it. Needs a special heat-resistant tape if you are going to be working with temperatures around boiling, though. 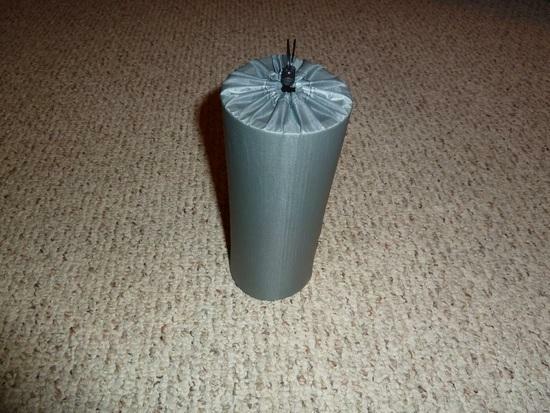 I'd make a tall cylinder with a circle taped-in on the bottom, but make the cylinder taller than your bottle on one side, and fold it over like an envelope. Use the adhesive hook-and-loop for a closure. That way it would be enclosed completely. For winter trips I carry my 1 liter wine bota under my GTX mountain parka. It never freezes. 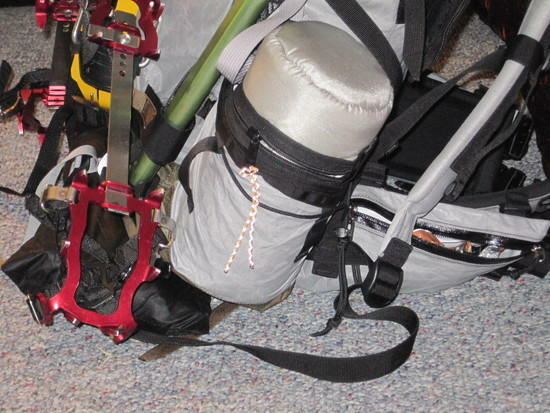 I changed out the carry strap for a 1/2 nylon webbing and QR buckle to sling over my shoulder. That way I can take it on and of without the need to remove my parka. Also you can keep your hydration bladder warm in your pack with just one chemical handwarmer in the AM and one in the afterenoon it temps are very low. 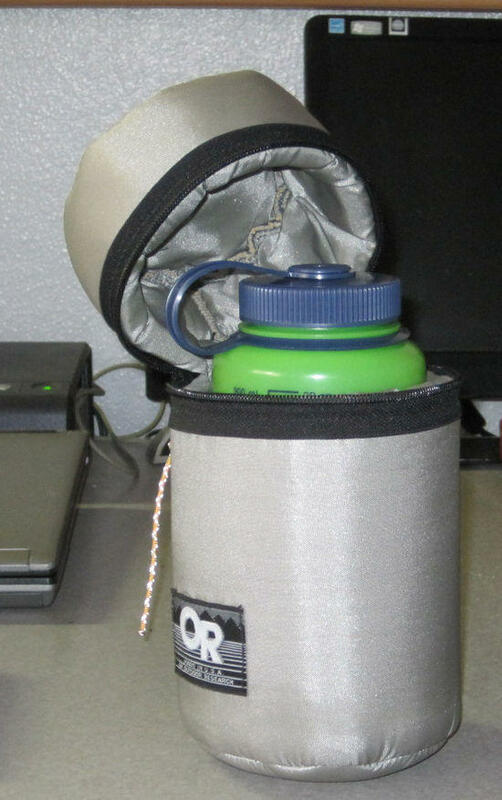 Keep the insulated drinking tube inside the pack if daytime temps are below zero. A friend can get it out for you to refill your bota. 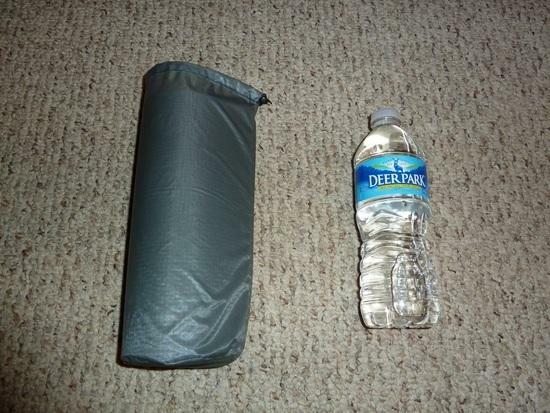 At night the bladder & tube goes in a dry bag and into the foot of your sleeping bag. Nalgene fits snug in OR insulator, but easy to remove bottle (add a piece of guyline as a zipper pull. In cold weather the wide cap of the Nalgene is nice with gloves. 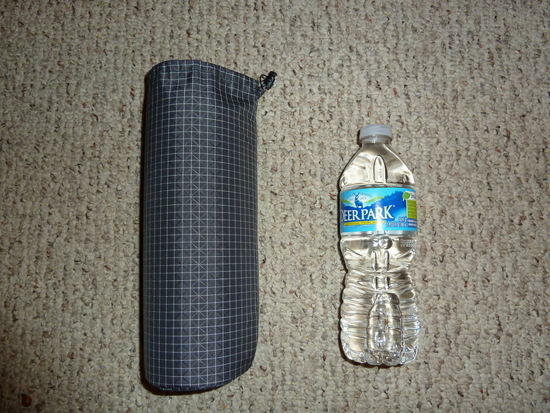 I ordered large water pockes on my McHale to handle 64oz Gatorade bottles, and the OR insulator is almost the exact same size. This uses 3/8" closed cell insulation on the sides and bottom. 31 grams (1.09 oz) for a 0.5 Liter size. Probably less than 2oz for Smartwater and Gatorade bottles. Just worked up a silnylon and 1/4" closed cell version. Weight is 16 grams (0.56oz) – half of the previous model.